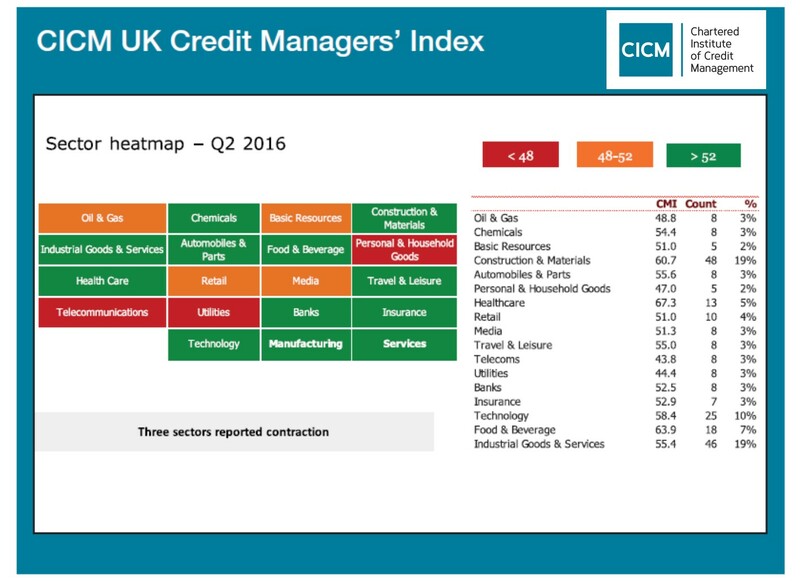 Business confidence continues to fall within the manufacturing sector following Brexit, according to the latest Credit Managers’ Index (CMI). The quarterly index generated by the Chartered Institute of Credit Management (CICM) shows that confidence within Manufacturing has fallen for the second quarter in a row, and while the pace of decline has slowed, the trend remains a concern on the back of the EU Referendum Result. But while there was bad news for Manufacturing in the midst of volatility in the financial markets and a drop in UK construction sector output, confidence within the Services sector has slightly improved and rallied after a poor first quarter, arresting the decline of the index overall. The headline index (including both Manufacturing and Services) stood at 56.1 – a fall of 0.5 points on the previous quarter. Manufacturing fell by 1.8 to 57.2 whereas Services improved by 0.06 to 55.63. The CMI, sponsored by Tinubu Square, is important because it gauges nationwide levels of credit being sought and granted by credit managers across the UK and acts as a primary indicator of actual levels of business being conducted. It consistently maps the FTSE All Share Index and the EU Economic Sentiment Indicator. With post-Brexit volatility comes the potential for concern about credit ratings. A fifth of credit managers said they would not allow a ‘risky subsidiary credit rating’ to be trumped by the parent company, though a further 18% said if a parent company risk profile was strong they would consider this. Only a third of companies had a clear process for making these decisions, underlining the need to review and update processes for this area so that they are not exposed to undue risk. Times may be challenging in some sectors but credit managers are still looking to ensure they get the support needed to help them do a better job and advance their skills. 64% of credit managers said they were getting this from their employers, but over a quarter (28%) believe they do not get the support and resources needed to improve their knowledge. Looking deeper into the results, the CMI revealed that in contrast to the second quarter all three ‘favourable’ factors (credit sales, new credit applications and order books) declined. Meanwhile, four of the seven unfavourable factors also improved; whereas in improvement on Q1 when all factors worsened. More good news can be seen regionally: again for the second quarter in a row every region reported ‘green light’ results – above a 52-point benchmark – with Wales reporting the strongest result (68.1) and the North East reporting the lowest at 52.5. Only three of 20 industry sectors (Telecommunications, Utilities, and Personal and Household Goods) showed contraction. The CMI is a diffusion index, producing ‘scores’ of between one and 100 (typically in a range of 40 – 60). Ten equally weighted factors are included – three favourable and seven unfavourable – and the index is calculated on a simple average of the 10 factors. The Chartered Institute of Credit Management (CICM) is Europe’s largest credit management organisation, and the second largest globally. The Institute was granted its Royal Charter on 1 January 2015. The trusted leader in expertise for all credit matters, it represents the profession across trade, consumer and export credit, and all credit-related services. Formed over 75 years ago, it is the only such organisation accredited by Ofqual and it offers a comprehensive range of services and bespoke solutions for the credit professional as well as services and advice for the wider business community, including the acclaimed CICM/BIS Managing Cashflow Guides (www.cicm.com).